This is an English translation from the Japanese original article, which was included in a Japanese book, "Film and New Media studies Vol.5 from Graduate school of Film and New Media, Tokyo University of Arts", published by Sayusha publishing Ltd., Kyoto, Japan in 2015. The article was originally written for bulletin of Tokyo University of Arts. Tsuchiya: I entered University of Tokyo in 1961 and graduated the doctor course in March 1970. At the first year of graduate school in 1965, we were able to begin using a big computer. I studied at Institute for Industrials science and in professor Watanabe’s laboratory for master course. I majored in Mechanical engineering, but Watanabe’s laboratory focused on ‘Control Engineering’. The laboratory’s theme was basically to apply computers into new fields. Soon I began to learn computer programming language at the computer center. The first language was "ALGOL" and secondly "FORTRAN". At that time Hitachi’s big computer was introduced to university of Tokyo. The students of graduate school began to study computer language. But students, who were older, did not study computer language. Probably they were busy or not interested with computers. At that time it was a time consuming work to write computer codes. I think I am one of the first generation people of writing computer programs in Japan. ―― What was the output you got from the first computer program? Tsuchiya: It was a kind of repeating calculations. It was to examine the results of calculations of an equation when parameters changed. It was like a spread sheet today. It is a calculation that is easily done by today’s Excel. ―― Professor Watanabe took a leadership of group meeting of Computer Based Art(CBA) which is a study group on creating Tankaa (Japanese poem of thirty-one syllables) using computers. I read the papers written by Mr. Kawano, an experimental aesthetic scholar, who was a member of CBA. Tell us anything about Tankaa study by CBA group. Tsuchiya: Mr. Kawano proposed a method of dividing many sentences into units of word by respective category, making ‘a transition matrix based on probability of words’ and selecting word by random numbers to generate poems. It was a kind of Markov chain. It enabled to create automatically sequences of words as poems. Professor Watanabe studied computer applications widely in many different fields. It was very interesting for me. He composed a school song for industrial high school using computer. He always said there were some more possibilities of computer applications. One of them was to create Tankaa by inviting Mr. Kawano as the leader for the project. There is an annual event, Emperor House’s Tankaa. It is a nationwide event to gather Tankaa and if the Tankaa is excellent, then the author will be invited to Emperor House. The theme of that year was "Fishing and Fisherman". We decided to create Tankaa of that theme by using computer. Mr. Kawano analyzed Japanese sentences into different category such as noun, adjective, verb and so which were used to make Markov chain probability matrix to make a model of generating Tankaa. (Fig.1 is not included as it is fully in Japanese) I was very much impressed to listen into his studies at my first degree of graduate school. It was the beginning of everything. ―― When the reflective exhibition of Mr. Kawano was held at ZKM (Center of Art and Media, Karlsruhe) from 24, September 2011 to 8, January 2012, The German researchers such as Margit Rosen were interested with this Tankaa work. I happened to collaborate with this exhibition a little. She asked me to exhibit some of my translation of the Tankaa into English under the management of poet Mr. Shigeru Matsui. ―― A symposium titled ‘Computer and Art’ was held at the Great Hall of Tama Art University on 9, October 1967. Prof. Yoshishige Saito(1904-2001) talked on ‘Trend of Contemporary Arts and Computers’, Prof. Shigeru Watanabe talked on ‘Today and Future of Computers’, Prof. Hiroshi Kawano talked on ‘Experimental aesthetics, the crossroad of Art and Computers’, and Mr. Shinnya Izumi (1930-) talked on "Computers in Industrial Design’. The symposium was organized by CTG(Computer Technique Group). The symposium pamphlet included CTG’s manifest. CTG, the pioneer group of computer art at the early stage was known as it was organized by Mr. Tsuchiya and Mr. Komura who was a student in the product design course at Tama Art University. They met at the 6th student director board of Fujita Construction Company in 1966. There were not many computers in Japan. It was extraordinary that CTG was a group of students though the access to computers was very much limited in any developed countries. Tsuchiya: Mr. Komura and I hoped to use computers of IBM Japan at free charge, as it should not be allowed to use computers for artistic purpose in University of Tokyo. If I used computers of University of Tokyo for some different purpose, the charge bill would come to laboratory, and it would cause serious problems, for what did you use computers? So we never used computers of University of Tokyo for creating computer graphics. As there was not high performance plotting machine in University, it was not possible basically. IBM Japan had a large plotting machine. We wished to use it. But there were no ways to do so. When we were thinking how we could do it, IBM Japan announced to invite applications of student’s paper contest on ‘computers and society’. We applied for this student paper contest. And fortunately my paper won a prize. There was a dinner after the prize giving ceremony. A manager of public relations in IBM Japan sat next to me at the dinner table. I talked him that we hoped to use computers for creating computer art works for free of charge. One week later the manager called me by telephone and suggested me to talk with the board director of IBM Japan. We visited IBM Japan and talked with the director. Our hope became true! If we could not use computers of IBM Japan, the works of CTG were never born. The director of IBM Japan had a deep understanding on Art. We knew later that he was younger brother of very famous poet, Mr. Daigaku Horiguchi. We were lucky absolutely. ―― It was one of talents to grasp the luck firmly. According to the article ‘Electronic Hippie’ in Asahi Journal (page 92, Fig.2) on 5 January 1969 written by photographer Mr. Daido Moriyama, "CTG of eight SAMURAIs is thinking a human-oriented appropriate use of computers against the so-called tools for the sake of ‘Big Companies’ = ‘Industrial Capitalism’ = ‘Institutional Societies’." The article looked like a reflection of sociopolitical situations at that time. Tsuchiya: Yes, it was. It was an extremely fascinating time with many things happened. The society was tumultuous. Student power was at the highest in 1968 and 1969. Page 91, Asahi Journal, January 5 1969. Photo by Daido Moriyama. ―― Did you join student powers? ―― It is a stupid question but I like to ask you, did you have any contradiction between the student power which you have sympathy with and the big capital company IBM of the United States? Tsuchiya: (laugh) I had contradiction….. But we had no other machines that we could use in Japan. There were no Japanese machines that could be used for computer graphics at that time. There were computers of IBM Japan in Tokyo and Osaka, there was CALCOMP plotting machine connected with computers. It was settled in IBM Kanda Data center just slant front of Mitsukoshi Department Store. We thought there were no choices other than using this machine. It was a contradiction. ―― To create computer graphics, it was necessary to use not only computer for information processing but also a device ‘plotting machine’ for making the output results into real world. As a member of the latter generations, I am grateful for you to have created computer art works while having contradictions inside. Tsuchiya: I think it was not bad. Company has such problems but all of the people in the company are good people. They always tried to make better products. They understood deeply what we were trying. ―― There appears always some delicate thing like mirrors when we use technologies. How can you stay away at appropriate distance and can you be careful not to be involved too much? Tsuchiya: It was necessary to make delicate decision. However we had hopes to do, we decided to think later. If we were thinking only, nothing would have happened. What is the way of computer? Tsuchiya: I thought that it would be possible to make games while coding many programs of computer graphics. I imagined if we make games by computer programs, it will be a fascinating world. ―― How did you think of computer games while coding programs? Tsuchiya: If a display is connected with computer, for example, a figure of doll appears walking from the left side of display screen, and then some obstacle suddenly appears in front of it. You can choose timing and position of obstacle. If the figure of doll kicks the obstacle, then it would fall down. This can be a game. I thought it would be very popular in the future. It was in 1968. ―― I am sure the works of CTG have humor and sense of playing game. It is interesting that they include trends of modern art not only OP Art. CTG applied figures of cultural icon such as John F. Kennedy and Marilyn Monroe to their works. They are presented as morphology or conversion in the grid coordinates of black and white. They were easily recognized by everyone. Tsuchiya: Mr. Komura selected such motifs. He knew it was very effective. It was an influence of POP Art in New York at that time. ―― It is completely different from the stoic computer arts in Germany. Tsuchiya: So. It was difficult to do things like CTG in the faculty of engineering of University. We did not use computers of University for creating computer arts. If we did so, the results would be the same as that in Germany. 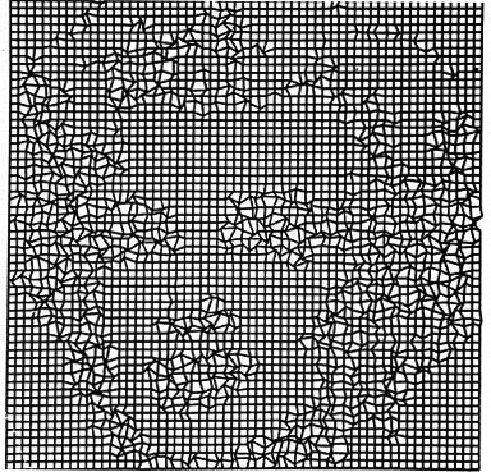 ‘Monroe in the Net’ (Figure 3, in 1968) is my most favorite work. The grid of the figure presents very much computer world. The grid point of Marilyn Monroe is fluctuated irregularly by random numbers. Rule of grid and freedom of random number appear in a graphics simultaneously. ―― Why do you think it is most like computer ways? Tsuchiya: Computer graphics is based on presenting point by grid coordinate of X - Y axis. Computers apply grid for 2 or 3 or more dimensional figures. On the other hand, random number is a factor that you can present something most unlike computers. If you make computer graphics only by geometry of X-Y coordinates, it tends to be a stubborn result. If you include random numbers in the works, you can create something free, irregular and fascinating. It is like an improvisation of modern jazz. ―― Is computer a tool for you? Tsuchiya: I think it is a tool basically. It is a kind of tool that has never been before. It is completely different from brush and color paints. It enables many things. It may be more than a tool. 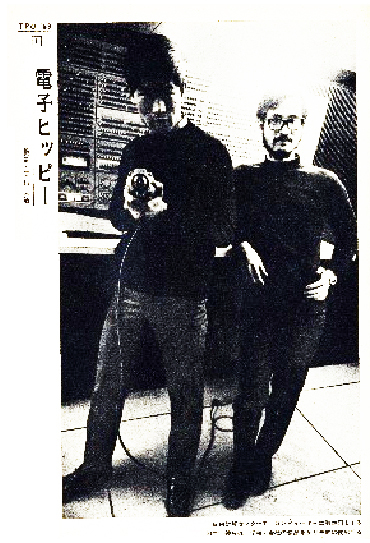 ―― On the other hand, Mr. Kawano considered that computer art is ‘Art of Computer’. Tsuchiya: Yes. His target was to let computer work intellectual activity. It is a most difficult task. As it was too difficult, what we could try was to apply random numbers. If we could use random number, computer could do something unpredictable, not so much intellectual. ―― So. Random number is the factor of automatism and accidental chance. Tsuchiya: Yes. Point is random number. However today you can choose the best one while trying many times by random numbers using personal computer. But at that time it took several hours to write codes to create one computer graphics only and you could get output with error messages several hours later. In such speed of getting output three times a day, correcting errors took many hours. It took almost ten days to finish a computer graphics. We did not know the charge of computer use as we used it without normal expense. But as it took many hours, we did not have enough time to try changing parameters and computational conditions to find the best one. If we could do it now, it is far easier by personal computer today. From the beginning, we should decide best parameters by time-consuming hand calculations. We were always forced to get the best output by only one try as we could not do it many times. ―― CTG was the only exhibitor from Japan to the first large scale international exhibition, Cybernetic Serendipity at Institute of Contemporary Arts, London, 2 August ? 20 October, 1968. Did someone of CTG go to see it? Tsuchiya: None of CTG went to London. As we were students, we did not have such money to travel to London. The exchange rate was 360 yen to US$1. (now it is 120 yen) It was necessary 500 thousand yen to go to London. No one talked about going to London. I remember that one of my friends took cargo ship for going to USA two years before. No member of CTG was rich. But if someone was rich, he would not create computer art. It was a very hard work, requiring much time and concentration. It was an impossible work unless one loved to do so. 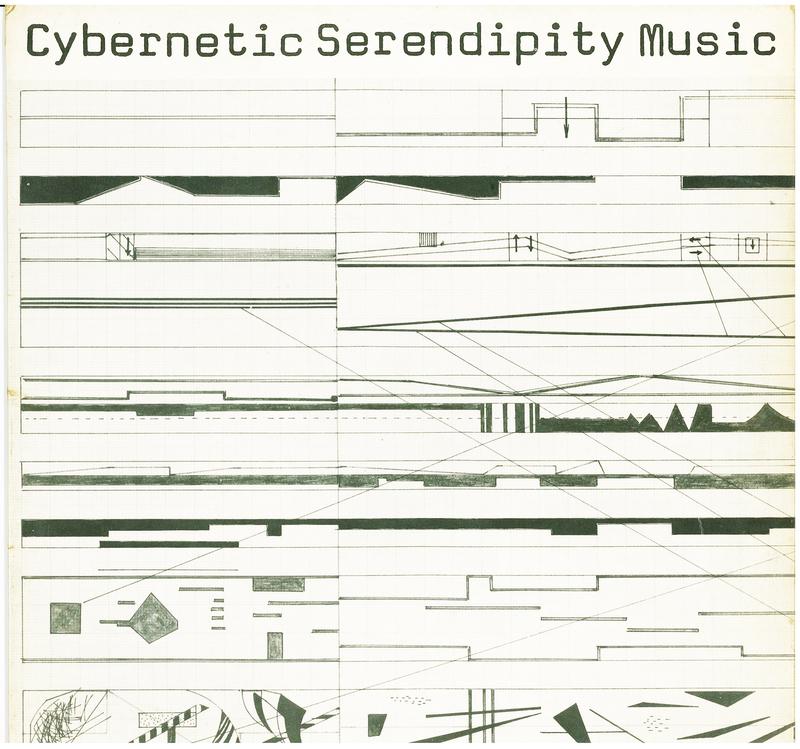 ―― I have the catalogue and LP record (Fig.4) of Cybernetic Serendipity. Works of CTG were displayed. They were group works. But LP includes Tsuchiya’s personal work, ‘Bit Music’. (2 and 3/8 minutes, stereo, 1967-68) Why? Tsuchiya: I sent our works with titles and author names of CTG. But I do not know how Ms. Jasia Reichart, the curator, treated them. The music was a computer magnetic tape. I slit it into two tapes. It is an experiment to hear directly the sound of computer magnetic tape. It was included in the LP. I was surprised to know that it was listed just after the work of famous Mr. John Cage in LP. ―― What kind of sound was ‘Bit Music’ ? Tsuchiya: It sounds like pihh, gihh, gahh. It has mysterious power. (laugh) The computer magnetic tape had twice as much width as ordinary sound tape. ―― How did you use computer tape? Tsuchiya: The magnetic tape had information that was transferred from big computer. I cut the magnetic tape of 16 mm width into two tapes of 8 mm width. It had the same width as sound tape which was popular at that time. The tape included a digital format of numerical data. ―― What is the meaning of the title ‘Bit Music’? Tsuchiya: It represents that the data was written into tape one bit by one bit. It is not a good title. I should have been more careful. ―― CTG made the APM No.1 (Automatic Painting Machine No.1). Is there any following machine? Electronics, photo by Nistuka, by courtesy of Masao Komura. ―― How sensitive were the sensors? ―― APM No.1 was a painting machine and also an interactive machine. 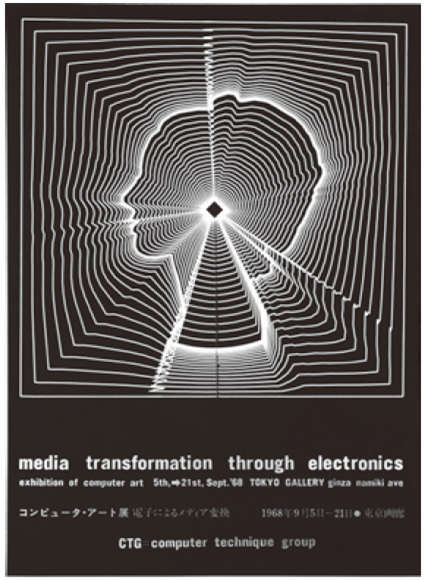 International Cytech Art Exhibition (Electromagica) was held by Japan Electric Arts Association (JEAA) at SONY GINZA building on 26 April - 25 May 1969. Art Journal ‘Bijyutsu Techou’, May issue of 1969 was a special issue featuring this exhibition with discussion titled ‘Mankind and Technology’. Discussants were Mr. Kuniharu Akiyama(1929-96), Mr. Takamichi Ito(1939-), Mr. Takayasu Ito(1934-85), Mr. Masaharu Sakamoto(1938-2011), Mr. Katsuhiro Yamaguchi(1928-), Mr. Yusuke Nakahara(the chair, 1932-2011), Tsuchiya and Mr. Komura. Tsuchiya spoke actively in the discussion, "Technology is being widely spread, specialized, distributed, and expanding. There is no specialist who knows all kinds of technology. Under such situation, it is a very interesting problem how the so-called artists can communicate with such specialized field of technology." It was very impressive that Tsuchiya definitely spoke, "I do not feel like that." against the opinion article presented on Asahi newspaper by Mr. Yoshiaki Tono (1930-2005),"Art and Technology go ahead toward on the same direction." Tsuchiya: I feel that science and technology are being rapidly specialized and distributed. The same is for art. ―― As CTG tried many kinds of experiments such as APM No.1, Thermal Field of Conversion of temperature and color, and Plotting Field. What is the art work for CTG? Tsuchiya: I do not know it is the definition of art works or not. Many of our work are formulated by basic rule and randomness. We intended to make works having irregularity and freedom using random numbers. For example, we made a grid pattern at first, and fluctuated the cross point by random number. It is difficult to determine the appropriate radius of fluctuation. The radius was determined by random number. At first we set only the rule and ran the computer. ―― It is possible to say that the program is essential in case of computer art. Tsuchiya: It may be so. If we could use today’s personal computer, we could determine most favorite form, size, or parameter change by trying modification many times. But at that time, it was one- shot game. Predicting the result, and get it. ―― (turning a work upside down) How is it if it is upside down? Tsuchiya: It is no problem for some work. ―― The CTG works which you and Mr. Komura keep now are works of papers. It is like drawings. Do you keep computer programs itself? Tsuchiya: We have little of them. Only the result work was important from the view point at that time. It was partly because we could not change our old concept. Probably we thought it was meaningless to keep computer program that only few people understand. ―― Even if you keep it, hardware is necessary to read it. Element of cutting edge technology become rapidly obsolete and it is ironical that the most fragile paper could survive long. Tsuchiya: It is so. That is the way things are. ―― The period of CTG activity was so short. Some people wondered why CTG finished its activity. It was told that the reason was graduation and employment finding, but it was not so as Tsuchiya’s announcement in 1970 showed impressively that CTG had done almost everything they could do at that time. Tsuchiya: We had questions about our activity as the student power became so strong. We had contradiction. We wanted to think of future society through computer technology. But the student power influenced us to consider what we should do. We sent final post card ‘We decompose CTG’ in autumn 1969. After that we held ‘Eve of mass computation, search for computer possibility, Gathering computer films’ at Iwanami Hall on 22 January 1970. It included the film works by Mr. John Whitney, Mr. Stan Vanderbeek and Mr. Takahiko Iimura. And CTG presented their film works; Computer Movie No.2’ and ‘Computer +something’. ―― At the film meeting you wrote "Now computer art require new relationship between engineer and artist. It was a thing of the past for me." What was the new relationship? Tsuchiya: I wanted the computer should change. I hoped computer become less expensive, everyone can use it and programming is easier. It was a time consuming work. I felt we had done almost everything we could do by this difficult machine. I thought less expensive computer and easy programming could be realized in the future. If such conditions could become true, then many people would enjoy computer art without distinction of engineer or artist. 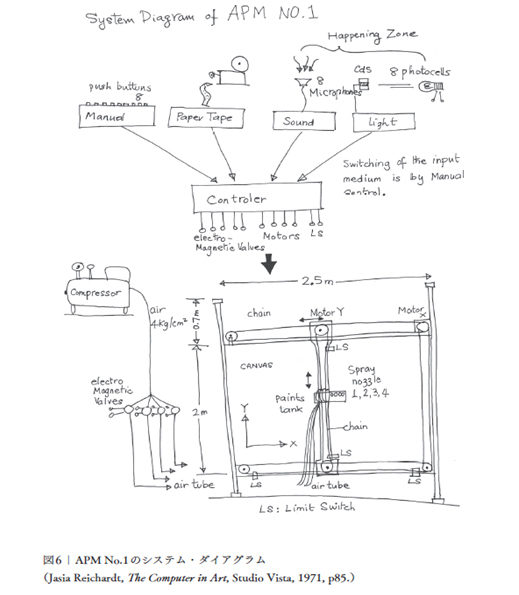 ―― The book written by Ms. Jasia Reihardt ’Computer in Art’ (studio Vista,1971, Fig.7) spare large part to CTG, and the last page was Christmas card from you. When I found it I wanted to see you. 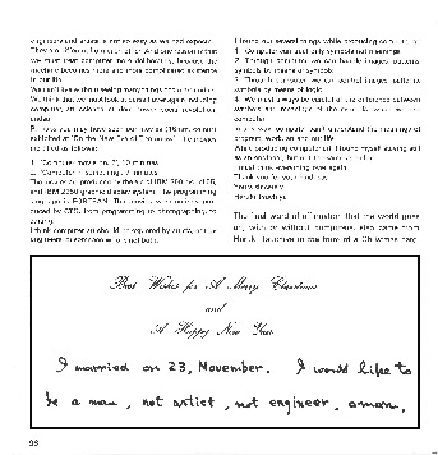 Fig.7　Last page of "The Computer in Art"
―― Did you use computer after the decomposition of CTG. How about the microcomputer in 1980s for example? Tsuchiya: I was fascinated with microcomputer in early part of 1980s until 1984. I went to Akihabara and bought computer kit and NEC machine. I wrote programming code by BASIC. I found BASIC was very useful. I could write program by BASIC instead of FORTRAN for big computers. My company, Research Institute for Systems Technology could survive thanks to microcomputers. I undertook jobs of developing computer simulation programs but I developed them by small computer instead of using big computer systems. When I bought a small computer and eight inch floppy disk drive, the investment was paid back within a few months as they paid the same expense of using a big computer. Small computers were very cheap and had higher performance for the people who could use them. But the people in the big computer world did not know this fact. ―― Computer graphics began to be used for advertisement in 1980s. Were you interested with them at that time? Tsuchiya: The performance of small computers was not enough to make good computer graphics. Mr. Komura asked me help his work of making computer graphics with big computers and I worked some times. Using big computer was still expensive and the programming was not easy. The price of small computer systems was around a few thousand dollars, I was fascinated with them. I made bar charts and graphs for statistical analysis by dot printer. But it was a very poor printer when looking back from today’s point of view. It was energy problem, not environmental problem. ―― It was unexpected that researcher of environmental problems came from Professor Watanabe’s laboratory. When I found your name by internet search, I supposed it was a name of a different person. Tsuchiya: Basically it was energy problem, not environmental problem. I worked in computer graphics at my time of graduate school, and when I finished doctor course by writing my doctor paper on engineering, I determined to finish working in computer art because I felt I had done almost everything I could do in the field. I thought Mr. Komura should continue doing it because he majored in art and design from the beginning. I felt I should do something different. Oil crisis attacked our world in 1973. I knew for the first time that Japan was very vulnerable against energy problem. So I began to study energy problems. It took almost three years. I concluded to myself "Japan should switch to energy efficiency improvement and renewable energy from depending heavily on fossil fuels and nuclear power." We should not use nuclear power as the final treatment of nuclear waste materials was not known. There were no technologies to solve the problems. I wondered why government applied such energy policy. It was irresponsible. I must talk about the reason why I began studying energy problems. I majored in mechanical engineering. It has four categories, such as Mechanical dynamics, Thermodynamics, Fluid dynamics and Material mechanics. They are basically all application of physics into real world. Thermodynamics includes energy calculations. We use the law of energy conservation, that is, input energy equals to output energy. And one more law. The law of mass conservation, that is, input mass equals to output mass. When we use the two laws, we can solve many problems by mathematical operations. My doctor paper was ‘a computer control system of blast furnace’. It was a mathematical model of iron production process from iron ore. Main part of the paper was energy calculation. Energy calculation is a familiar world for me. Variety of energy units and energy conversion loss are difficult for economists to understand. But such things are familiar to me as the thermodynamics theory shows engineering solutions. Engineers usually understand energy loss of 30 to 40 % inevitably appears through energy conversion process. ―― Was it master course when you began studying energy? Tsuchiya: Yes, it was. We studied energy at the bachelor course but it is not in the details. There was not a course of studying energy specifically in Japanese university. It is because energy is a basic concept of physics and a general theme for engineering studies. Any students studying engineering in master or doctor course should understand the concept of energy and can tackle with energy problems if he or she intends to do so. I was not thinking environmental problems at the time of energy crisis in 1973. The problem was to use energy more efficiently. Global warming problem grew larger in 1990s and mass media usually treated it as environmental problem. But it is originally energy problem. If we efficiently use renewable energy harnessed on the ground, not digging resources from underground, the impact on environment would be smaller. Around 1975 researchers at Japan economic research center promoted a research project ‘Japan of 21st century.’ The center is a part of Japan economic news paper. I was encouraged to join the project and I intended to propose a solution of energy problem to the project. Soon I heard that the similar idea based on efficiency and renewable energy was published in USA. We read the paper and decided to translate the book into Japanese. It was ‘Soft Energy Paths’ written by Amory Lovins. My friend and I translated it into Japanese in 1979. It was similar with energy policy supported by Democratic Party in USA. ―― Congratulation! So I understood that as your CTG activity was at the time of master and doctor course of graduate school, it was a thing of the past after that. Did you appear to CTG related exhibition together with Mr. Komura after the decomposition of CTG? Tsuchiya: No. I told Mr. Komura that it was his own world and he should do it as he liked. The reason I quitted from computer art was that I had nothing to do with it anymore. I was looking for next theme I should tackle with. And the oil crisis happened. Tsuchiya: Amory Lovins, the author of ‘Soft Energy Paths’ has received many prizes. He was given ‘Blue Planet Prize’ from Asahi Glass foundation in Japan in 2007. It was given to the person who contributed to solving global environment problems. Also he was given the honor of the Earth Hall of Fame KYOTO in 2013. When he was a student at Oxford University, Ex-president Bill Clinton was his classmate. He worked to retrofit the empire state building by support of Clinton Climate Fund in 2008. Lately in 2014 he gave lecture for JANFRE (Japan Assembly for Nuclear Free Renewable Energy) which was founded by two Ex-prime ministers, Koizumi and Hosokawa. When COP3 (The 3rd Conference party of United Nations Framework Convention on Climate Change) was held in Kyoto in 1997, WWF Japan (World Wide Fund for Nature) asked my institute make scenario of decreasing energy consumption and CO2 emission in the future. We are now developing new energy simulators. Simulation of hydrogen supply to fuel cell in automobile and cogeneration of supplying electricity and heat for residential energy demand using hydrogen. After March 11, we are developing simulation program of supplying electricity to all the demand from domestic renewable resources, largely from solar and wind. ―― Is it possible to supply electricity largely from solar and wind? Tsuchiya: Yes, it is. Head quarter of WWF international at Swiss published their report on January 2011 that renewable energy could supply all of the energy demand in the world. Just after that we experienced East Japan Great Earth Quake on March 11. After that WWF Japan asked my institute make similar report about Japan. As March 11 was a great shock to me, I had already begun the work when WWF Japan visited my office. I am now writing many technical papers on such scenarios. ―― But the real political power would be terrible enough. Tsuchiya: At least no one can increase nuclear power. Any politicians will not be against increasing renewable energy. The report by WWF International showed 100 % renewable energy supply to all the demand in the world could be possible until 2050. It showed the energy supply would be from biomass, hydro power, solar photovoltaic, wind power and so. This was the third time that WWF Japan asked my institute make energy report since 1997. We calculated the decrease of energy demand at first. Main reason of demand decrease was the population decrease of Japan. Population will decrease by 20-30% in 2050. This will inevitably decrease energy demand. Efficient technology will decrease energy demand furthermore. We have developed an hourly dynamic simulator of electricity demand-supply throughout a year. We made four reports (Energy conservation, renewable supply, cost estimate and electricity grids) which everyone can download at the site of WWF Japan. ―― Concerning to future prediction, there was a word ‘Futurology’ in old times. Tsuchiya: What is futurology? It seems that someone predicts, and he does not do it. I like to do now what will be in the future. If none does it now, I like to do now what I think future should be, instead of just predicting future. That is my way of thinking. Tsuchiya: This sentence is a question with negative mind, ‘Is it possible to have a computer utopia?’ I presented this question at first. However I wrote there were many possible things. For example, I described that computer will find some natural law while handling massive data automatically as if Kepler found the law of moving planets.. It is data mining technology today. As it was known that computer could be used in many fields, it is unnecessary to think about possibility of computer utopia. Now we know what a computer is. ―― It is interesting that you thought that the truth of computer appeared. Tsuchiya: So what? I was thinking in 1980s what would happen after personal computer have prevailed so much. I work to make computer software. But ordinary people only read screen. So it is necessary to make a machine for reading screen. That is an electronic book. I compared energy consumption of paper and electronic book. I calculated that electronic book was 20~40 times more efficient than paper. I thought it was valuable to develop such a machine. In the late 1980s, liquid crystal display appeared instead of CRT (Brown tube) One American company released the first personal computer with large liquid crystal display. When I saw the photo of it, I decided to develop ‘electronic book’. We started developing a trial prototype in 1989 and completed the first experimental machine on 27 November 1989. It was 25 years ago. As it is still working, we made a movie picture and uploaded it to YouTube as ‘Electronic Book No.1’ and the home page of my institute. We extended the concept of this experimental machine to ‘Digital Book Player’ (Fig.9) which was co-developed with NEC. 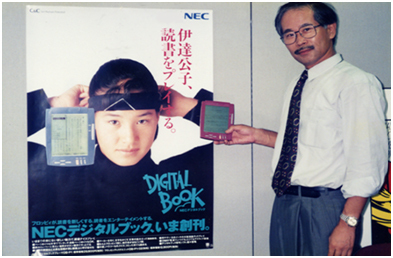 We produced first products of Digital Book in 1993. But it could not catch mass market. I imagined connecting it with telephone or wireless communication in the future. There was not Internet. And the telephone line was very slow. So the Digital Book took out information from floppy disk. When we applied a patent to USA, we drew figures of flying text in the air. We imagined it would be possible. When battery became efficient and light, electricity consumption of liquid crystal display became less, and internet became popular, Apple and Amazon released iPad and Kindle in 2008. Now I read newspaper by iPad or iPhone instead of reading real paper. There is no problem with disposal of electronic newspaper after reading. What I feel now is that it took twenty years to realize a new concept. Considering computer art also, it took twenty years or so. ―― You feel what you imagined became true. ―― I hope the third would become true. Tsuchiya: Yes, it will be so soon. Solar photovoltaic causes no noise and can be put on anywhere such as factory roofs. The conversion efficiency of solar light to electricity is getting as high as 20%. Problem is the cost, it is expensive. In 1989 I studied a quantitative method of how photovoltaic cost could be decreased in the future by learning curve. It shows the cost reduction when production increased. If you have cumulative production data at horizontal axis and cost at vertical axis, the histories of many massively manufactured products show that cost fell down exponentially along with increase of cumulative production. Cost fell down along learning curve of floppy disk, television, micro wave range and so. But if cost fell down to a certain level, it will not fall down anymore. It is when the cost is nearly material cost. Automobile is such sample. I wrote a paper that the historical data of photovoltaic cost fell down to 80% each time the cumulative production doubled. If this trend continues in the future, the cost will decrease and will be widely used. In reality, the photovoltaic cost rapidly fell down between 2000 and 2012. ―― It is a beautiful result, including the third thing being realized. If we want to have something new, philosophy is most necessary. At first I am embarrassed how to connect your story after CTG, now I can see some of your consistency when I heard about your experience. ―― You were indispensable for what CTG accomplished. Tsuchiya: It is my honor to hear such words. Thank you so much. He founded Research Institute for Systems Technology in 1979. He was one of the founding members of CTG (Computer Technique Group) and created computer graphics in 1960s. He designed electronic book in 1989 and developed Digital Book in corporation with Nippon Electric Company Ltd. in 1990s. He has worked in energy system analysis and published books and many articles on future technology and energy emphasizing efficiency improvement and renewable energy toward sustainable development. He worked 100% renewable energy scenario study for WWF Japan in 2011-2014. 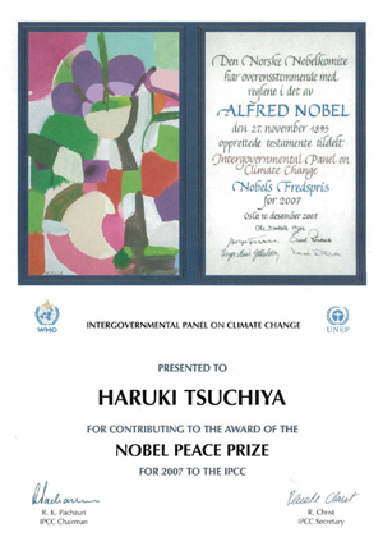 He was endowed the award certificate of the Nobel Peace Prize 2007 from IPCC for his work for 2nd working Group of IPCC 2nd report in 1995. He worked as a member of several national committees on future energy technology for Ministry of Environment. He is an advisor to Low Carbon Society Project of National Institute for Environmental Studies. He received B.E, M.E and Dr of Engineering at University of Tokyo.